» Sedimentation rate, concentration of macronutrients and flux for NE14, Toolik, Dimple, Perched during Summer 2009. We measured the flux of bulk material and major macronutrients (carbon, nitrogen and phosphorus) from the water column to the benthos in four separate lakes during the summer of 2009. The lakes were chosen to investigate the impacts of disturbance on lake sedimentation. Two of the lakes, Dimple and Perched, were within catchments that were burned by the 2007 Anaktuvuk River wildfire. Two of the lakes, NE-14 and Perched, were receiving elevated sediment loads from thermokarst failures on their shorelines, and Toolik Lake was used as a reference lake. As such, the lakes were organized by disturbance regime: Dimple = fire only, Perched = fire + thermokarst, NE-14 = thermokarst only, and Toolik = undisturbed reference. In each lake, NE-14, Toolik, Dimple and Perched, we deployed two clusters of three sediment traps at a depth of approximately 5 m. Each sediment trap cluster consisted of three 9 cm diameter tubes suspended vertically in the water column approximately 1 m from the bottom of the lake. A single float rope extending from the center of each sediment trap cluster to the surface of the lake marked the location of the trap. During the summer of 2009 sediment trap clusters were initially deployed in the lakes listed above from early to mid June. Sediment trap clusters were allowed to collect material precipitating out of the water column for durations of 2 to 3 weeks based on how frequently the individual lakes could be accessed with helicopter support. Traps were sampled by carefully raising the trap cluster to the surface and pouring the contents of each sediment trap into a separate 4 L cubitainer. Once each trap was sampled the entire cluster was immediately redeployed at roughly the same location in approximately 5 m of water. Once collected, we returned the water to Toolik Field Station and forced aliquots through precombusted (500 degrees Celsius for 2 hours), 0.7 micrometer pore size, glass fiber filters for the analysis of percent organic matter, concentrations of particulate carbon, nitrogen and phosphorus, concentrations chlorophyll a and pheophytin, and stable isotopes carbon-13 and nitrogen-15. 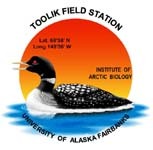 For analytical methods see ‘Protocols of the Arctic Lakes LTER' http://ecosystems.mbl.edu/ARC/lakes/protocols.html on the Arctic LTER webpage. We calculated bulk sedimentation rate as well as carbon, nitrogen and phosphorus flux rate (mg m-2 d-1) by first measuring the mass of bulk particulate matter and macronutrients carbon, nitrogen and phosphorus in each trap (mg), and then dividing by the area of the trap (m2) and the duration that the trap was deployed (d). Version 2: Updated to newer metadata sheet (with sites). CH March 2013.